Overview of the 2014 Subaru Forester available in Troy, Detroit from Southfield, Michigan. The redesigned 2014 Subaru Forester is turning heads and making headlines. Seriously, it earned Motor Trend's Sport/Utility of the Year Award, and the Car Connection declared the Forester the Best Car to Buy for 2014. Your Detroit Area Dealership in Southfield offers the award-winning 2014 Subaru Forester. Just because the 2014 Subaru Forester is a staple of the rugged terrain and utilitarian handling characteristics that are essential in the Detroit area market doesn't mean it can't also be a comfortable daily driver. Relax in comfort and with the most recent in advanced tech features in the new 2014 Subaru Forester. 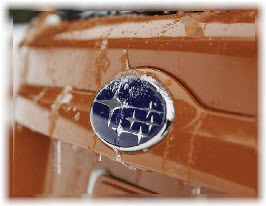 You already know the kind of exterior styling the 2014 Subaru Forester offers. This is the ultimate in the wagon class in the modern era. As one of the last wagons still in production the 2014 Subaru Forester doesn't have a whole lot of competition for the champion slot, yet this doesn't mean we've stopped innovating and delivering the pinnacle of style for you. The land-loving Subaru Forester SUV beat out luxury vehicles by Mercedes, Land Rover and Porsche to take home the award. In fact, it beat 13 other new/updated crossovers. Motor Trend judged the Forester on some heavy criteria including its efficiency, its safety, its value, its design, its engineering and the ability of its many features to perform as advertised. The Forester was particularly worthy, according to its critics, when it came to value, gas mileage and driver enjoyment. Request pricing from the Troy and Waterford area. On the question of value, Car Connection pointed out that the Subaru Forester offers standard all wheel drive which is extra on almost every competitor. On the question of style, Car Connection pointed to the fact that the redesigned Forester is "fully sorted" to fulfill both requirements of a well-made SUV. Critics liked how the vehicle offers plenty of room and utility features while still providing a cabin that would make any family content and comfortable. Critics especially liked how even the base model of the Forester fit these criteria. 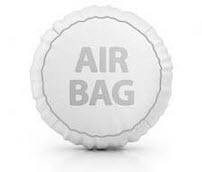 This added to the true value that they saw in the 2014 Subaru Forester. What does this mean for Michigan drivers? Well, the Forester's AWD is made to help drivers cope with even the most punishing winters. The 8.7" clearance helps, too. The Turbo offers a 250 horsepower/258 torque combo that is sure to compete in the toughest, fastest road traffic. Drivers can shift their way with both a manual and an automatic choice. 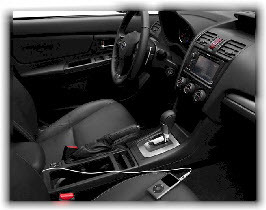 The manual is Subaru's special, fully-synchronized 6-speed model. 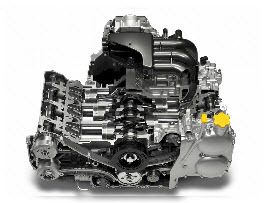 The automatic is Subaru's Lineartronic CVT. Continously variable, Lineartronic makes maximum use of the Forester's power. CVT offers a special low mode, 6- and 8-speed manual control mode, and paddle shifters. The Forester is packed with crash features such as seven airbags, including a knee airbag for the driver, and front row active head restraints. The Forester also offers safer driving systems through its Vehicle Dynamics Control, Traction Control and unique speed-sensitive power steering. These systems work together to improve the car's response to the driver's instructions. 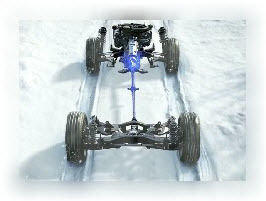 These systems coordinate the steering angle, speed and braking force to improve stability, wheel slippage and balance. The result is better handling, improved traction and ultimately a safer ride. Area Dealership in Southfield, serving Ferndale and Troy, MI. *The above information is regarding the base model 2014 Subaru Forester. Standard specs and features may change from year to year. Contact Glassman Subaru with any questions regarding the new or used model you're inquiring about.